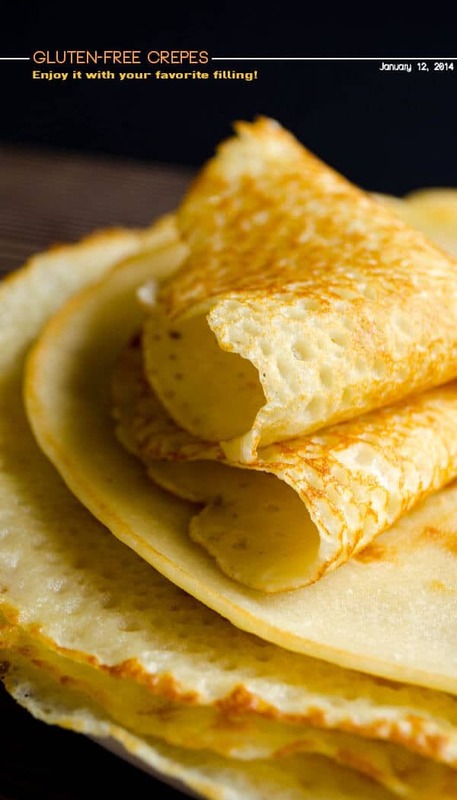 Wonderfully thin gluten free crepes made with rice flour are no different from regular crepes! So easy to make with only 4 simple ingredients. Perfect for several filling options! 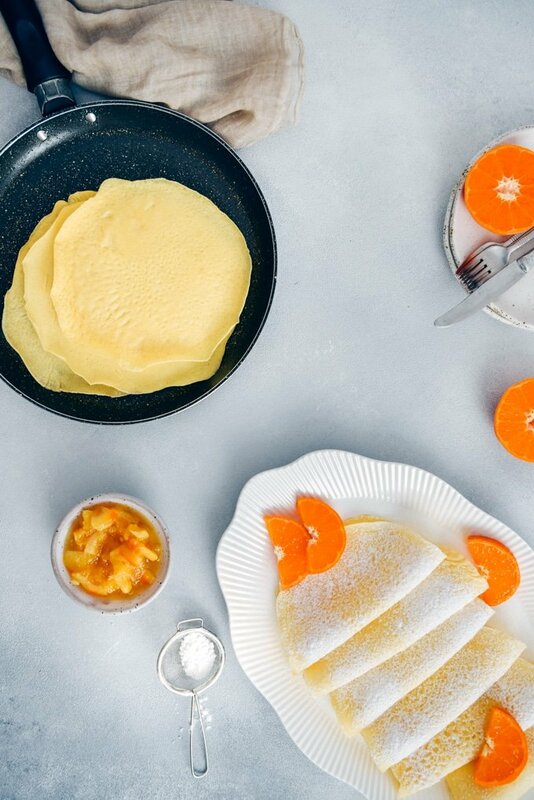 Prepare an Uh-mazing gluten free breakfast with these rice flour crepes. See the video tutorial below! Who doesn’t crave for a festive like breakfast on a Sunday morning? 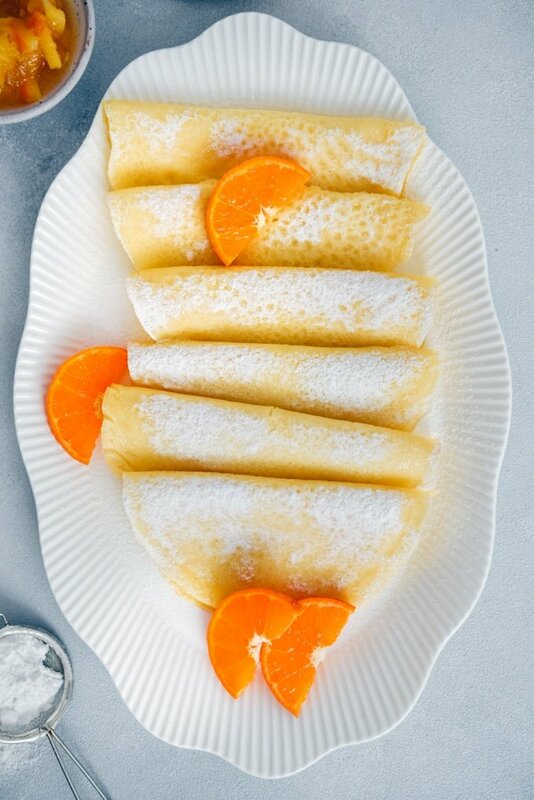 All family members are around the table waiting for the surprise food of the week and you already know what to make: Paper thin homemade crepes! What if you have to follow a gluten-free diet? 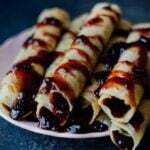 Then you should try these gluten-free crepes with rice flour that taste as good as my regular crepes. There is a misunderstanding among many people about following a gluten free diet. They think that you are limiting yourself when you avoid gluten. On the contrary, a gluten free diet makes you adventurous about cooking because it is way richer than a regular diet. You tell me now, which diet is richer? Although nobody in my family has a gluten intolerance, I love to test recipes without regular flour. It’s a passion for me to discover new tastes. Among all the options above to make a gluten free crepe batter, I have tried just one of them for now: Rice flour. I’ve made several white rice flour recipes before and my Fudgy Gluten Free Brownies With Rice Flour are always a hit. But these are my first crepes with it. Yes! All types of rice including white rice, brown rice and wild rice are gluten free. So is rice flour. On the other hand, to be a hundred percent sure, you’d better check the label on the package because it might come into contact with gluten products during manufacturing. It’s safe when there is no gluten warning on the package. If you are one of those who don’t want store-bought products and are crazy about making things from scratch, good news! You can make your own rice flour at home! Soak the rice, dry it and then grind in a grinder when it is still slightly moist. This method is mostly used in Indian cooking. No soaking in the second method. Buy a grain mill for this purpose and grind rice in it finely. You will end up with super fine rice flour when you grind rice twice. Store your homemade rice flour in an airtight container in the refrigerator. Although there are several rice flour recipes on the blog, personally, I don’t think it’s really necessary to make your own rice flour at home when it’s super easy to buy it from store. I would make it if I already had a mill, but not sure whether it is worth buying only to make rice flour. I made these gluten-free crepes this morning and they were utterly scrumptious! They taste no different from my regular homemade crepes made with all purpose flour. It was the first time I used rice flour in a crepe batter, so I went a bit experimental about the measurements and had the right amounts after a few trials. I wasn’t sure at first how much batter I should pour into the pan to make them paper thin since I was afraid the batter wouldn’t hold well in the pan. I understood that rice flour didn’t make any change about the consistency and the cooking process. Plus, they look just the same as the crepes I always make! Pour the milk and melted butter. Add in the rice flour and whisk well. Note: If you prefer making crepes with pancake mix, make sure it’s gluten free. Check the ingredients and use it if it is made with rice flour or other gluten free flours. You can add some flavor to your crepes by adding mashed banana in the batter. First, combine all the ingredients and have a smooth crepe batter. Second, heat a non-stick pan until hot. Grease it with butter using a non-stick brush. This is just for the first crepe, you don’t need to butter it each time because the batter contains melted butter. Third, pour crepe batter in the middle of the hot pan using a ladle or pour 1/4 cup of batter. Roll the pan from side to side so that the batter spreads evenly and gets a round shape. 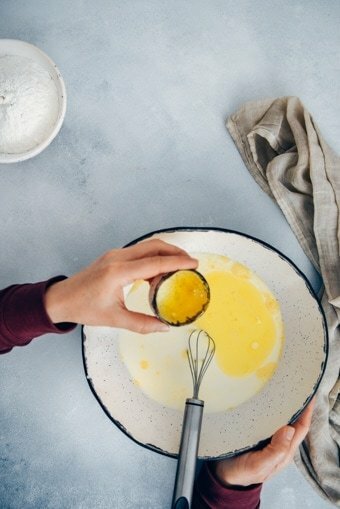 You shouldn’t add any more batter on it. Fourth, cook it until you see bubbles on the top and the batter is no longer wet. Fifth, flip it over using a spatula and cook the other side about a minute or less. 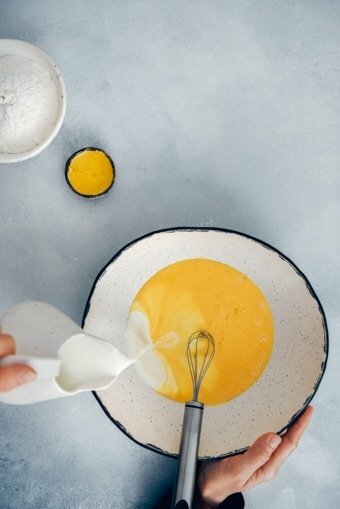 Transfer it on a plate and repeat the same steps for the remaining batter. 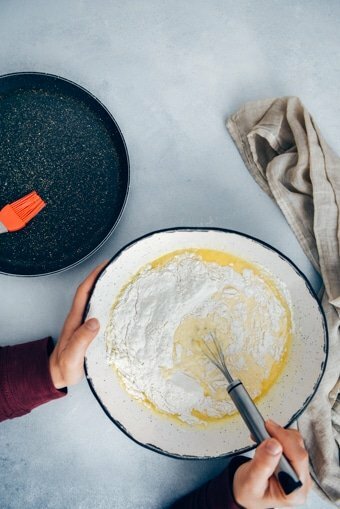 What Milk Can I use For Crepe Batter? You can make the batter with any milk you want. If you want to go dairy-free, use coconut milk, soy milk or almond milk. We often make Almond Milk Pancakes and they are perfect, so I’m sure vegan milk options work fine in this recipe too. 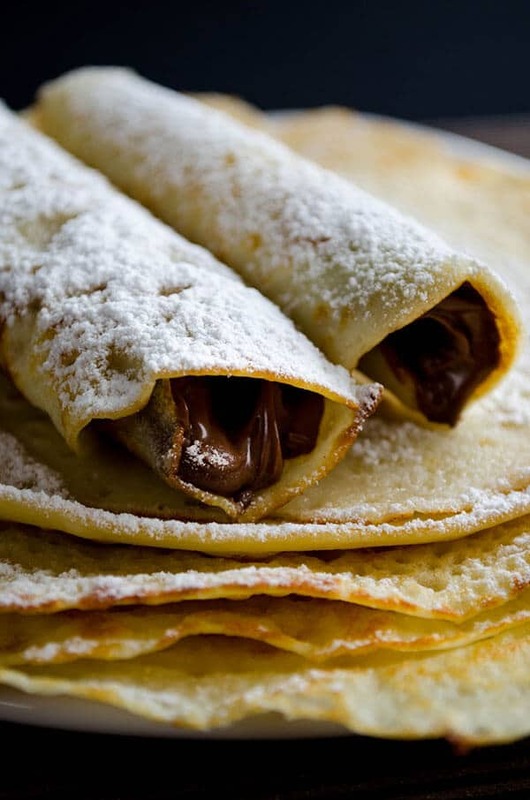 Nutella stuffed gluten-free crepes not only make an amazing breakfast, but they also make a delectable dessert. Sift a little powdered sugar to make them even more appealing. So you can easily make these to satisfy your sweet tooth when you don’t have time to prepare a chocolate cake. Do Not Be Shy About Experimenting With Crepe Fillings. Want to learn more rice flour recipes? We have several of them on the blog. Check the following recipes out! Recipe is decent, but like all recipes online I must once again ask. 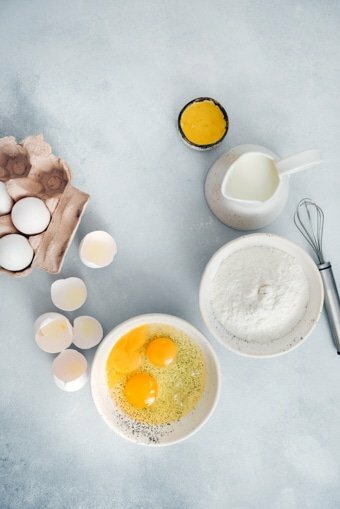 WHY DO YOU WRITE A NOVEL OF UNNECESSARY INFORMATION BEFORE THE INGREDIENTS AND QUANITIES, it does not trick anyone into reading your life story, all it does is insure we skip this website next time we look for more recipes, do us all a favour and post the actual recipe up top and leaving the reading below for anyone who ACTUALLY WANTS to read. Can they be made ahead of time and frozen? Has anyone tried with coconut or almond milk? Hi, do these crepes freeze well? Hi Melanie! Never tried freezing them, so I don’t want to mislead you. Hi there! I was wondering if it is possible to replace the milk in the recipe with soya bean milk instead? They came out great. We just got back from France and these are as good as anything we had there. Hi Priya! I’m so happy to hear that you loved the recipe! Thanks for letting me know!